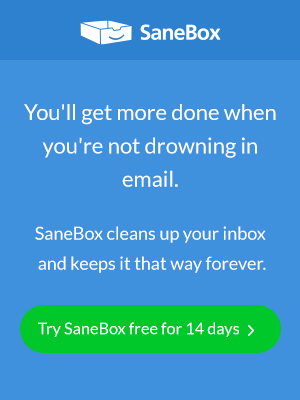 Well, first of all, if you’re using Sanebox, you won’t have that problem. But what about the people receiving your emails? Wouldn’t it be great if, rather than dreading them, people actually looked forward to hearing from you? It’s time to stop being part of the problem and start being part of the solution. If in doubt check the FTC guidance on the CAN-SPAM act. Your subject line is arguably the most important part of any email. Get it wrong and people won’t even open it. As a result, some marketers have resorted to tactics such as clickbait subjects, reasoning that the recipient, driven mad by curiosity, will have no choice but to open the email. First of all, give your audience some credit. A study by Return Path found that clickbait headlines were among the least effective subject lines, and while having RE: or FWD: in front of an unsolicited sales email might have gotten an open last year, we’ve all seen that trick a million times now. The problem with tactics like these is they only tend to work once. Even if your misleading subject line gets your email opened, how’s your audience going to feel when they realize they’ve been duped into opening your email? Yup, you’re going straight to the black hole. Instead, use smart subject lines that don’t insult your recipient’s intelligence and clearly communicate why they should want to open your email. You can’t throw a stone on the internet without hitting a post on creating audience personas, yet if we have actually written up a persona we tend to make them up or focus on meaningless demographics. What do they really want, beyond the obvious? Hate to break it to you, but there’s only one sure way to find out. Invest a little time in talking to your audience (or potential audience if you’re just starting) and get to know them. Then, once you know your audience, write to them. Write to them as an individual. When sending an email to more than one person, we tend to stop sounding like people and start sounding like soulless salesmen. Read your email aloud (pets work wonders for this). Every time you shudder or squirm, that’s a point your reader will shudder or squirm. Delete, then rewrite. When your email sounds like it was written by a human being, then you’ll stand out above the majority of marketing emails. Usually, they’ll start getting to the point somewhere in the second or third paragraph, but by that point, the recipient has rolled their eyes and thrown your email into the bin. When the recipient opens your email, it should be immediately clear to them how you’re going to make their day better. Their time is precious. Respect it. Keep your email to the point, focusing on your customer’s needs rather than your ego. Storytelling has become something of a buzzword for content and copywriting, but people either shy away because they don’t think of themselves as ‘creative’ or misapply the direction and tell stories that the reader doesn’t care about. This doesn’t have to be complicated though. Remember, we want to respect our reader’s time, not create the next War & Peace. Doesn’t this contradict the advice to get to the point? Not if it’s done correctly. Tell a story about them, their problems, and your solution. It doesn’t have to start with Once upon a time; I started this post with a story, all about you and your battle with your inbox, and hopefully, you’re still reading. One of the best examples of this is Ramit Sethi, and I’d recommend signing up for his emails even if only to analyze his clever use of story to spark interest and add value. By adding a story, you’ll be adding an emotional value to your email, as well as the material value, and your recipients will enjoy reading it. We all like it when others respect our inbox, but now it’s time to follow the golden rule and make sure we’re respecting theirs too. Don’t be spammy and don’t mislead your recipients, but rather deliver clear and focused value in an engaging style that will appeal to your audience. Then not only will your recipients read your emails, they’ll actually look forward to receiving them. Find this helpful? Learn how Reply can help you with all the stages of a successful email campaign and take the software for a free trial run today. Oleg Campbell, CEO and Founder @ Reply.io, has 10+ years of previous experience in software development, comprehensive technical background, and a strong sense of business, eager to share business and technical expertise to a wide audience. Next Entry What Are the Best Email Clients?